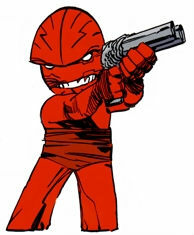 In the realm known as Dimension-X was a planet called Glum World that was inhabited by a race of diminutive red-skinned aliens. This world was ruled over by the dictator known as Ba-Goom. Eager to prove what a talented warrior he was, Ba-Goom decided to target Dragon for death. The hero had gained a reputation following his confrontation with Deathseed which made him the perfect selection for Ba-Goom to gain respect. Ba-Goom teleported to Earth where he prepared to make his move against Dragon but his teleportation device was broken by the young Angel Dragon. Stranded on this planet, the alien made the best of his situation and befriended the child who dubbed him Mister Glum. Dragon dismissed the threats made by Glum and allowed him to live with him in the Dragons’ family home. When the Dragon Family found themselves stranded in Dimension-X after an attack by the Lummox, Mister Glum was finally able to return to his home world. He was distraught to discover that his race had been exterminated at the hands of Dark Dragon and attempted to avenge their deaths. Glum and Dragon barely survived the confrontation before the family all returned to Earth. When Angel Dragon was abducted by the Vicious Circle, Mister Glum volunteered to aid an army of heroes in rescuing his friend. During the resulting battle, Sgt. Marvel was killed and his mystical weapon, the God Gun, was chanced upon by Glum. This weapon could grant its wielder anything that they wished for although there was believed to only be one bullet left to fire. Angel desired to become a grown-up but Glum misunderstood her wish to become big and concocted a serum that enlarged the child to gigantic proportions. The enlarged Angel destroyed her home and badly injured her mother. Glum restored Angel and took her into hiding, killing the Creator and claiming his hideout for his own. After debating the wording for his wish for many months, Glum finally had Angel form a wish that would grant him everything he desired. The God Gun was fired and all humans of this Earth would be forced to obey his every command. All of humanity was enslaved for over a year where they were instructed to try and transform the Earth itself so that it resembled Glum’s own face, much as Glum World did. Dragon spent this year attempting to assassinate Mister Glum whilst hiding out on Vanguard’s spaceship. He eventually destroyed the God Gun which reversed all of the wishes made, liberating humanity. Glum realized that he was no longer safe on Earth and prepared to flee back to Glum World. He was surprised that Angel Dragon wished to accompany him, her own actions under his enslavement shaming her. The couple discovered that they had fallen in love over the years and teleported to Dimension-X. Mister Glum had not completely abandoned his vendetta against Dragon and monitored him through a viewing screen from Glum World. He and Angel set about forging an empire in Dimension-X, and over the years they conquered several planets. On one such invasion, Glum and Angel encountered an incarcerated WildStar. He warned of Earth’s impending destruction at the hands of Emperor Kurr. This prompted the couple to begin their own invasion which led to a brutal battle with Kurr. Angel succumbed to the red mist unleashed by Kurr and passed away in his arms. Glum attempted to avenge his beloved’s death but his battle-suit was quickly dismantled by Kurr, leading to a very swift defeat for Glum. Glum’s plan to take over Dimension-X soon hit a snag when the Awesome Eater eats the planet on all his soldiers are in. He plans to amass a new army with Angel Dragon, but is attacked by Malcolm Dragon, Angel Murphy, and Rex Dexter. Glum is able to kill Dexter after Dexter kills Angel Dragon. Malcolm is able to beat Glum and has him arrested. News reports then start mentioning that Glum is going to have a trial. Glum finally has his trial and decides to defend himself. However, in the middle of the trial his combat suit comes in and Glum is able escape despite Dragon, Malcolm, and Angel trying to stop him. Glum later kidnaps Angel Murphy and takes her to his home planet where he gives her a haircut and Angel Dragon’s costume, as he wants Angel to fill in the love role the old Angel fulfilled for him. She resists at first, but when he mentions that her mom is somewhere on the planet, she decides to stay on the planet. However, Jennifer Murphy quickly finds Angel and knocks out Glum while the mother and daughter flee the planet. Glum later finds the pair and allows them to leave on the condition that they don’t tell anyone where he is located. They comply. Sometime later Glum is attacked by drones and he believes that Angel and Jennifer broke their word. The drone attack brings the attention of aliens who then proceed to attack Glum, but Glum is able to teleport them to Earth. Glum visits DarkLords base and sees a device that merge all realities which he presses. Knowing that Angel now shares the memories of the previous Angel whom Glum loved, he confronts her. However, she tells him that she could never be with him because of all the bad things he had done. Angry, Glum pulls out a gun to murder Angel, but the gun explodes seemingly blowing up Glum. However, Glum fakes his death to hide from the heroes, and find a pregnant Jennifer Murphy in cryo stasis, and slits her throat and opens her belly pulling out an infant Angel. Glum then walks away with the baby Angel, to mold her into his ideal Angel.